Robert Burns was born in 1759 and very famous as “The Bard of Ayrshire” or “Scotland’s Favorite Son”, and sometimes called as “The Bard” in Scotland, also well known as an active Freemason for 15 years throughout his life until he died on 21 July 1796 at the age of 37. On the other hand, Adam Smith was born on 5 June 1723 (Baptism) in Kirkcaldy, about 15km north from Edinburgh, and died in Edinburgh on 17 June 1790 at the age of 67. He is also a well known Scottish moral philosopher and a pioneering political economist with two major books of “The Theory of Moral and Sentiment” in 1759 and “The Wealth of Nations” in 1776 with the word “invisible hand” under laissez-faire. These two great Scottish distinguished persons lived in the same period of the second half of 18th century. When Burns published his first collection titled “Poems – Chiefly in the Scottish Dialect (Kilmarnock Edition)” in 1786 at the age 27, Smith already came to fame by his two books and was appointed to a post as Commissioner of Customs in Scotland and became one of the founding members of “Royal Society of Edinburgh” lived in Edinburgh with his mother. Are there any relationships between Burns and Smith? Yes, Adam Smith was vital and indispensable for Burns’ success as a poet even they had no chance to meet directly. Robert Burns was born on 25 January in 1759 as the eldest son of William Burns, a tenant farmer in Alloway located in the south of Ayr in Ayrshire, which is about 50 km southwest from Glasgow, Scotland. He has three younger sisters and three brothers, and spent his teen-age years as a farmer with his family. He was initiated into Lodge St. David Tarbolton on 4 July 1781 at the age of 22 recommended by his friend Bro. John Ranken, where he was passed and raised on 1 October 1781. Lodge St. David Tarbolton was integrated into Lodge Tarbolton (Kilwinning) St. James No. 135 right after he was initiated and he was elected Depute Master there on 27 July 1784, three years after raised, at the age of 25 under WM Sir John Whitefoord. He served as Depute Master there for four years until 1788 and often honored with supreme command. In those days, the Master of Lodge was a mere figurehead, and it was the Depute Master who carried out the working of the Lodge. 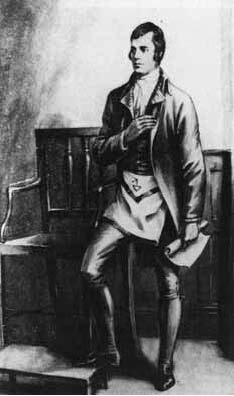 During the Masonic season of 1784 he never missed a meeting and was heavily involved in Lodge business, attending nine meetings, passing and raising brethren and generally running the Lodge. During 1785, as Depute Master he initiated and passed his younger brother Gilbert Burns being raised on 1 March 1788. He had a real zest for freemasonry and he appreciated that true Masonic friendship is intimately bound up with the company of one’s brethren and cannot be disassociated from the lodge room, hence the number of meetings were under his direction. According to some records, there were many lodge meetings well attended during the Burns’ period than at any other time. He must have been a very popular and well respected Depute Master of Lodge Tarbolton (Kilwinning) St. James No. 135 in Tarbolton, Ayrshire. The date of his publication by a Freemason of his first Kilmarnock Edition of poems titled “Poems – Chiefly in the Scottish Dialect” on 16 April 1786 was five years after his initiation into Freemasonry and during Depute Master of the Lodge. When 620 copies of his first Kilmarnock Edition was published, 567 copies were put in advance order by Freemasons in Ayrshire including Robert Aiken, a lawyer for 145, Gavin Hamilton, a lawyer for 40, his relative John Kennedy for 20, Hamilton’s friend John Logan and David McWhinnie for 20 each, Robert Muir for 72, John Wilson for 70, Sir John Whitefoord, Master of Lodge Tarbolton (Kilwinning) St. James No. 135 for 35, other lodge members for 75 and Gilbert Burns for 70 copies, and the report of his talent as poet was circulated toward Edinburgh through the fraternal network of Freemasonry. Burns earned about £50 as royalty prior to his departure to Edinburgh. Burns’ popularity as a poet aided his rise in Freemasonry in Scotland. At a meeting of Edinburgh St. Andrew Lodge No. 48 in 1787, in the presence of the Grand Master of the Grand Lodge of Scotland, Burns was toasted by the Grand Master, Most Worshipful Brother Francis Chateris. When he was received into Edinburgh Lodges, his occupation was recorded as a “poet”. In early 1787, he was feted by the Edinburgh Masonic fraternity. The Edinburgh period of Burns life was fateful as further editions of Burns poetic output were sponsored by the Edinburgh Freemasons, ensuring that his name spread around Scotland and subsequently to England and abroad. So, what was a relationship between Adam Smith and Robert Burns? According to his Commonplace Book, he already read Smith’s “The Theory of Moral and Sentiment”, a lecture of the University of Glasgow, at least before his age of 24 most probably around 17 years of age, and received a great influence from this book, he said. He was an ardent admirer of Adam Smith. When Burns came to Edinburgh for the first time in December 1786, Smith had already become to fame as a pioneering political economist and he hosted a certain luncheon club named “Oyster Club” with several people of distinction in Edinburgh. Almost all of the major members of Oyster Club were Freemasons and they assisted Burns by Masonic Fraternity. 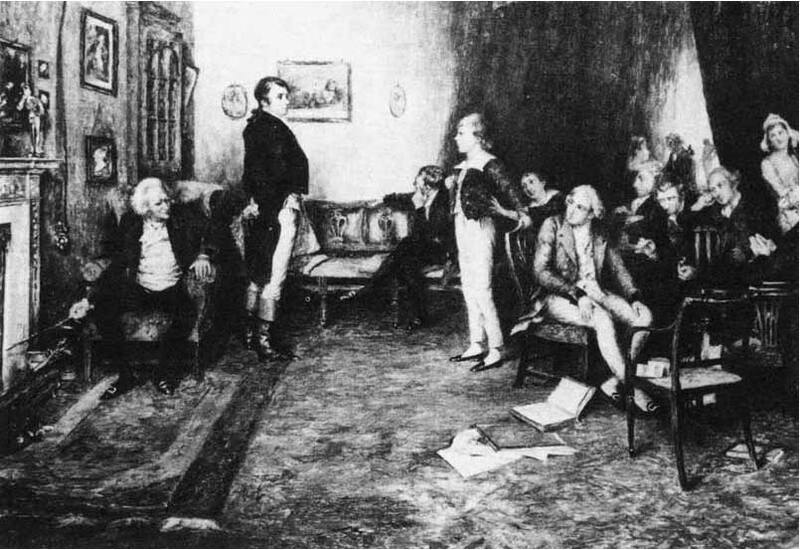 John Mackenzie, Medical Doctor and Burns’ home doctor, Hugh Blair, Professor of the University of Edinburgh and an old friend of Adam Smith, Dugald Stewert, Professor of the University of Edinburgh and a friend of John Mackenzie, Basil William Douglas-Hamilton, Lord Daer, Adam Ferguson, Professor of the University of Edinburgh, William Robertson, Professor and Principal of the University of Edinburgh, who were all Freemasons, were major active members of Oyster Club and supported Burns for the publication of the second edition of “Poems – Chiefly in the Scottish Dialect” (called as Edinburgh Edition). There is one episode that Sir Walter Scott (1771 – 1832), a famous poet and writer in Scotland and also a Freemason who adored Burns, could have met Burns at a drawing room of Professor Ferguson in 1788 when he was 17 years of age, because Scott was a close friend of Ferguson’s son as a classmate. Adam Smith himself was not involved in the activities of those members of Oyster Club, however Smith already recognized Burns’ talent from the first edition and put in advance order for Edinburgh Edition of “Poems – Chiefly in the Scottish Dialect” and Burns strongly desired to meet him. When we mention about Burns’ desire to meet Smith, there is one important lady between Burns and Smith, whose name is Mrs. Frances Anna Wallace Dunlop, and they started to exchange correspondence in 1786 after Kilmarnock Edition published, and she became a patroness for Burns. She was the person who advised Burns to visit Smith in March 1787 in her letter, and Burns visited his home, however just one day before his visit, Smith already left Edinburgh to London for the medical treatment of his stomach, and Burns lost this only chance and could never had met him. Without the existence of Adam Smith, there came no success for Robert Burns as a poet and no chance to become “The Bard of Ayrshire” or “Scotland’s Favorite Son”. Was Adam Smith a Freemason? There is no recognition in his personal records as a Freemason, because after his death on 17 June 1790 at the age of 67, all documents and material concerning his personal life or personality were burned for some reason, and also nothing was discovered in the records of lodges in Edinburgh District to recognize that he was a Freemason. So, probably he was not. However his life was just like that of a Freemason. After the publication of his book “The Wealth of Nations” in 1776, he was awarded by the Scottish Government with the guarantee of £600 per year as a life annuity and his annual income became £900 including his wages as Commissioner of Customs in Scotland and royalty on his books. This level of income was 3 to 4 times of normal income for the university professors at that time. But in spite of his wealth, he lived a very simple life. He was not married and lived his simple life with his Mother in Edinburgh. After his death, it became clear that he spent over 90% of his annual income donating anonymously to philanthropic charity relieving people who need help, which was made clear afterwards by the donated side. Furthermore aided some young outstanding artists and scholars by hosting Oyster Club as well. His life was like Freemasons indeed through the tenet of “Brotherly Love, Relief and Truth”. In the period of the second half of 18th century, the situation in Europe was a turbulent one with the American War of Independence (1775 to 1783), the French Revolution (1789 to 1799), the War between Great Britain and France (1793) etc., and many people of intellectual classes, including Burns and Smith, being involved to some extent in these dramatic changes. The interesting thing is that people in the intellectual classes were connected through some kind of fraternal networks to assist each other, even in the different areas of interests such as poetry, economy, politics, philosophy, medicine, law etc. 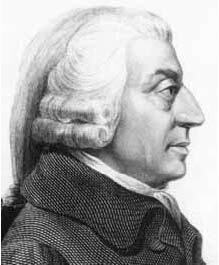 In fact, Adam Smith had some connections to Benjamin Franklin (1706 – 1790), a well known Freemason, Thomas Jefferson and other leaders in America, France, and he is a very interesting scholar at that period in Europe as well as the possibility of a connection to Freemason. Finally, what was the background why Robert Burns became a Freemason and how did he spend his life as a Freemason? 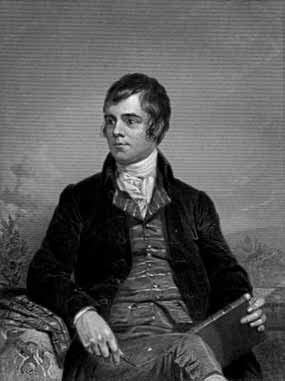 The second half of 18th century was also a period of enlightenment as well as turbulent time with the American War of Independence, French Revolution etc., and Robert Burns lived very interesting life as a poet in the early stage of British Romanticism. During this period, enlightenment activities ran through European countries. In France, for example, this activity became a political movement to obtain the liberation from Ancien régime by Louis XVI de France, however it was rather the movement to motivate the knowledge diffusion in Britain. This was caused from the difference of the status of each country. When Burns showed up as poet, he was introduced as a very poor farmer poet with no educational background. It was correct that he was poor however he had much knowledge and learned a lot of things by reading many books with complete understanding, though he was not graduated from college or university. He had already read Adam Smith’s “The Theory of Moral and Sentiment” when he was probably at the age of around 17. He also read the book “Discours sur l’origine et les fondements de l’inégalité parmi les hommes (Discourse on the Origins and the Foundations of Inequality among Men)” written by Jan-Jacques Rousseau (1712 – 1778) published in 1754 and was greatly influenced by it. He read such books and made poems in his spare time while working as a farmer, and furthermore he helped support his farmer colleagues while reading many books as possible. In September 1788, seven years after he became a Freemason, he created “Monkland Friendly Society” with Robert Riddell, an independent farmer, and developed a “Traveling Library System” for these farmers able to read books in their local fields, because he thought that the enlightenment to these people in the lower class was very important for society as well as for individual. His enlightenment activity was not only for himself but for his colleagues under the spirit of “Liberty, Equality and Philanthropy” which is Masonic spirit as well as the background of the French Revolution historically. On the other hand, in those days of 18th century, Scotland and England were politically united as one Britain, however the emotional hostility between two countries were still in existence and they were not well matured to be in single spirit to unite them. Burns advocated through his poems to encourage the solidarity of both countries based on the spirit of brotherly love. His philanthropy was developed in his teen-age years and his personality led him quite naturally to Freemasonry. Masonic society well accepted his spirit rather than a poet in the beginning and then after that they acknowledged his great talent of poem and started to support him. There is no question about that Robert Burns was a great lyric poet, however in early publication of both Kilmarnock and Edinburgh Edition, so-called lyrical poetries were only about 10%. He made over 600 poems during his rather short life until he died at the age of 37, and many of them were filled with the importance of human rights, the principle of equality, philanthropy and brotherly love. He also made some poets with regard to the emancipation of slaves and the equality of the sexes. The typical example of his attitude was the poem titled “Ode For General Washington’s Birthday”, written on 25 June, 1794, to admire George Washington for his birthday. This was a political poem to show his sympathy to the spirit of the French Revolution and to grieve the suppression on freedom in Britain as well as the admiration of Washington for his endeavor to win “Liberty”. Also there is one poem which was published in 1838 in Edinburgh as Chamber Edition, 40 years after Burn’s death, titled “The Tree of Liberty” admired the French Revolution. Since it was discovered late after his death and was not his own handwriting, there were strong arguments if it was really Burns’ poem or not for a long time and still there are some arguments. But by the enthusiastic research works of Thomas Crawford etc., it was acknowledged as his own poem in 1960, and since then this poem was contained in Burns’ collection. It seems to have written during 1793 or 1794 while he was forced not to publish any political poems, and it reflects his fundamental spirit of philanthropy and humanity. Robert Burns was a person filled with a plenty of humanity and philanthropy, and became a Freemason as a natural result according to his strong faith in God, his own thought and philosophy. He made over 600 poems during 15 years of his period as a Freemason and ended his life of 37 years on 21 July, 1796 at Dumfries in Scotland. This article is reproduced with the kind permission of the author, Bro. Koichi Terasawa.